El ContiRoad Attack 2 EVO redefine los límites en Sport Touring. More sophisticated tread pattern design with pronounced drainage function. Perceptible improvement in wet grip properties thanks to newly developed compound. 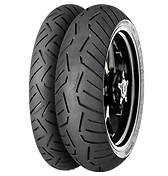 Tried-and-tested multi-grip technology for extended mileage and maximum grip in extreme banking maneuvers, coupled with exemplary overall mileage performance thanks to markedly deeper tread. TractionSkin makes for an extremely safe and short breaking-in period. Making this possible are a revolutionary buffed tire surface and a specially coated tire mold that gets by without separating agents. A high-level response to the safety and comfort demands of touring bikes. Outstanding handling properties, singled out for honors many times over. Easy Handling - redescubre la carretera. El neumático polivalente con los estandares de calidad y rendimiento más altos del segmento Touring. Nuestra pieza maestra en Sport-Touring. Neumático premium Sport Touring a precio económico.